Back in April when I shared this cake I made for my daughters birthday, one of the fellow blogger asked me if I can share how I made the roses. Though I made this tutorial that same week but due to many things going on I couldn't post it. Sowmya sorry for the delay, but here it is. I thought the best way to share would be by pictures, so I made a pictorial but still just in case of a doubt I'm writing the simple instructions also. Note : I used off-white color candy melts & tinted as much I wanted in different colors. Many forums I checked says that color candy melts comes in 12 oz. packs also, so make sure U have right weight of melts otherwise U have to reduce the quantity of corn syrup. Melt Candy Melts over the double boiler, turn the heat off add corn syrup and stir. Slowly the chocolate/mixture will start to seize & will come together like dough. Turn out mixture onto waxed paper, using paper towel dab it to soak extra oils. Let sit at room temperature to dry. Wrap well in plastic wrap and store at room temperature until needed. Let it hardened overnight atleast. Notes : On wilton site it doesn't say to dab extra oil from the clay but I've added that step here. I infact used the double layer of paper towel & put the clay in it & kind a squeeze it but still I feel clay had lot of softness to it. Many forums suggested this step as most important & I feel it too. I'll suggest to repeat this step if U feel clay is too oily to touch. 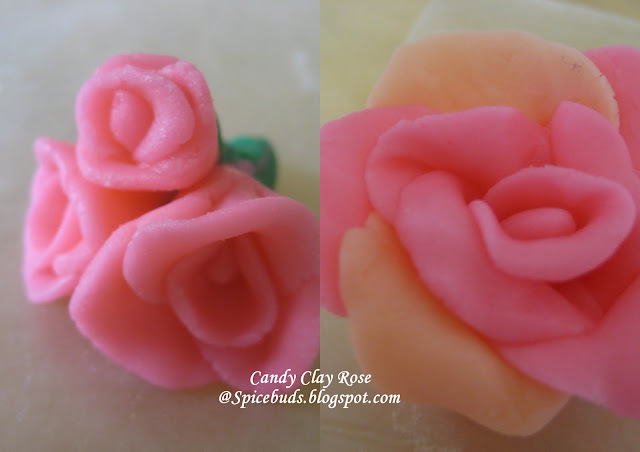 As in my case while working with clay I had to take several break b'coz of too soft clay or may be next time I'll try to use better quality candy melts as that can also make the difference. If anyone have any experience with this, please share it in the comment section and I'll add it in the post. Storing Candy Clay : Wilton says it will stay fresh for several weeks, but no exact number is given, neither could I find on any forums. I made this batch on 1/april & rest of the clay was wrapped in plastic wrap, further packed in ziploc, kept on kitchen counter away from direct sunlight. I used it on 15/may for some cupcakes, tasted it before putting decorations, it was good, so I believe it stays good for long time and in any case it contains chocolate and sugar so can't go bad easily. Clay will be hard at first, knead the candy clay & tint it with the color U want. pinch a small ball out of it almost double the size of white chickpea and roll it to make smooth ball. shaping into tear drop : put it on any smooth surface like kitchen counter, now using your pointer finger gently roll it only on one side to get the pointed side. once it's done make it stand on smooth surface. make 4 more balls out of the clay, these one are the size of white chickpeas. each ball will make one petal and depending upon what size of rose you want there will be no. of layers of petals. Usually for roses first layer is of one petal, second is of 3, third layer is of 5 petals & so on. take one ball and using your pointer finger & thumb press it to flatten it. to give you an idea how big is the flattened ball I'm showing both the pieces together. cover around 3/4 length of the teardrop centre/bud we made earlier by starting at one end, covering the teardrop & coming back to the same point slightly overlap the beg. of the petal, I believe picture gives you exact idea here. now the teardrop is actually looking like a bud take a moment to admire it. Repeat step 7. Starting from little before from the point where first layer petal is joined, attach this petal to the bud remember this is second layer of petals so we gonna use 3 petals to cover the bud, each one slightly overlapping the previous one. a small rose is ready. time to add 3rd layer of petals. Make a ball little bigger then the previous size.I'm using diff. color petals just to make it clear how they are wrapped/overlapped. following the details given in step 10 add 5 more petals one by one. 1. This candy clay recipe makes very soft clay when you work with it and also have lot of oil in it. So, best way to work with it, roll the dough in powder sugar and try to avoid using palm of your hands preferably work with fingers only, as they generate less heat as compared to palm. 2. Whenever clay gets too sticky or soft, leave it for a while. 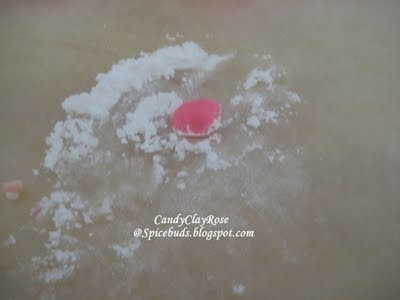 Before starting to work with it again, rub some powder sugar on your hands and on clay. 3. 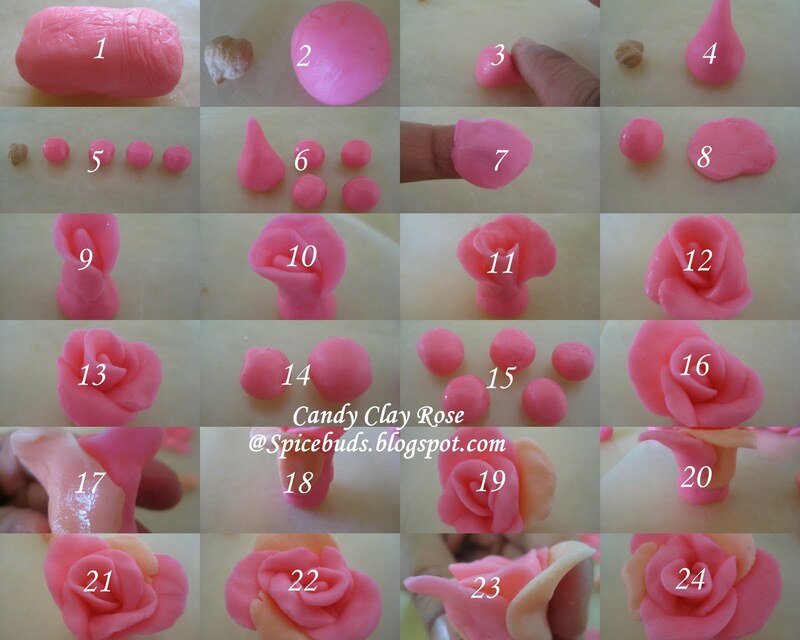 Gently keep rolling the bottom part of the flower between your finger to make it thin as after all the petals it will look little too fat & at the bottom, once U get the right size just in rolling motion only pinch the extra clay from the bottom & reuse it. 4. Give them atleast 2 days to dry to be on safer side, I usually make them a night before & let them sit on counter covered with net to dry. They dry(but still soft) and hold the position by next day but not like rock hard. 5. Do not refrigerate the decorations, once they dry keep them in air tight container till ready to use. I enjoyed working with it as it brings two of my fav. things together Craft and Baking(well not exactly but it is used to decorate the baked stuff, so I'll count it in baking category).